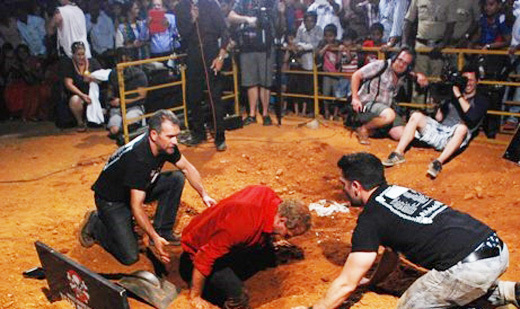 Udupi, Feb 23, 2015 : Aplause and whistles rent the air of Udupi when Dean Gunnarson, Canadian escape artiste, performed his ‘buried alive’ act emerging out of a metal strong box after being buried for 24 hours at Christian PU College grounds in the heart of Udupi Feb 22, Sunday. Throughout the night, there were at least 60 persons near the site, where hero Gunnarson was buried. There was a CCTV camera inside the box, through his movements could be noticed. 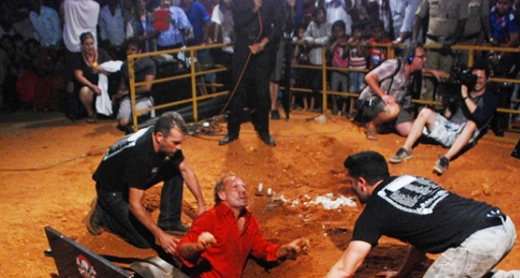 He had come out of chains tied to his body in the box by 10 p.m.
People waited with bated breath in silence to watch hero Gunnarson come out of the box and then from soil covered pit. First, one of his hands was seen waving. Then he slowly rose up to resounding cheers from the huge crowd gathered around. Soon after coming out, he spoke to the gathering and said that he was tired and weak. He said, “You gave me the courage and force to escape. Thank you for your support. Nothing is impossible,” he said and went on a victory lap around the ground. Speaking to media hero Gunnarson, who has been performing escape acts for the last four decades, said that it was dark inside and very tough in the box. He had not had any food or water when he was buried in the box a. 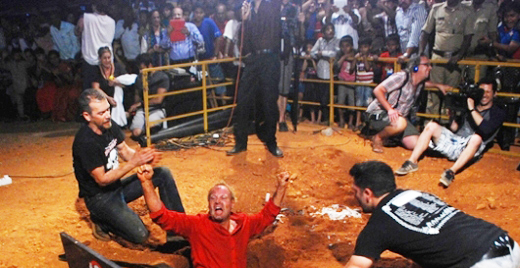 “I concentrated and pictured my family and friends while inside the pit. I was also overwhelmed from the encouragement I got from the people from outside,” he said. The event was organised by Gili Gili Magic Troupe headed by magicians Professor Shankar and Shankar Junior. 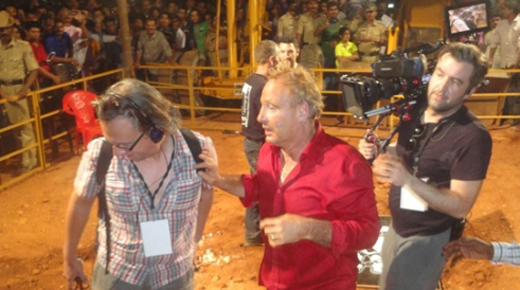 Shankar Junior said that this great stunt man Gunnarson had not had any food for last four days. He was on liquid diet for the last two days before performing the act here. Since Gunnarson was very hungry after coming out, food and refreshments were served to him on the grounds and he could be seen cheerfully relishing the food and freedom.